Simply drop a TCalendarLite component on the form and get a functional month-calendar. BorderColor: the color of an optional border around the calenard (default: clSilver ). Add coShowBorder to the calendar's Options to display the border. 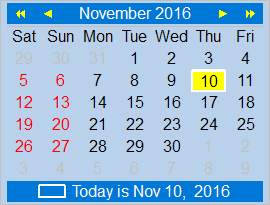 DayLineColor: the color of an optional separating line between the top navigation pane and the calendar's day area (default: clSilver ). Add coDayLine to the calendar's Options to display the line. HolidayColor: the text color used to display holidays (default: clRed ). Add an event handler to OnGetHolidays to define which days are holidays. coBoldHolidays: Draws the day number of holidays using bold characters. Holidays are normally off, but you an add an event handler to OnGetHolidays in order to define holidays. coDayLine: Adds a separating line between the top navigation line and the calendar's day area. coShowHolidays: Activate highlighting holidays. Note that there must be also an event handler for OnGetHolidays which defines the holidays. coShowTodayFrame: Draws a rectangle around the "today" cell. coShowTodayRow: Shows a line at the bottom of the calendar to display today's date (see also: coShowTodayName). coShowWeekend: Highlights weekend days (see also: Colors.WeekendColor). OnDateChange: Fires whenever another date is selected in the calendar. OnDrawCell: Can be used to override the painting process of a day cell completely or partially. If the boolean parameter AContinueDrawing is set to true the normal painting process continues after leaving the event handler; if it is false then no default painting occurs for this day. The event can be used, for example, to add birthday or holiday icons to the day cells. OnGetDayText: Can be used to modify the text display for the specified day. The default is a string showing the day value. Using this event, the names of holidays can be added to calendar, for example. OnGetHolidays: Defines which days of current month are holidays. The day number of the holidays are encoded as set bits in a 32-bit integer. OnHint: Defines a hint which can be displayed in a popup hint window for each day. Useful, for example, to show the name of holidays if the mouse hovers over a holiday. OnMonthChange: Fires whenever another month is displayed in the calendar. Can be used for more efficient holiday calculation. OnPrepareCanvas: Is called immediately before a cell is painted. Can be used to override Brush and Pen properties, for example, in order to draw different backgrounds for appointments and important events. procedure AddHoliday(ADay: Integer; var AHolidays: THolidays): Adds the specified day to the holiday bit list in parameter AHolidays. Make sure to have the calendar Option coShowHolidays set in order to highlight the holidays in the calendar. If the calendar's PopupMenu property is empty a built-in popup menu is provided which displays all the holidays of the currently selected year. As usual, this popup opens with a right-click onto the component. This page was last modified on 12 September 2017, at 12:01.